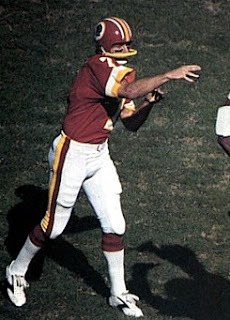 Runner-up for the Heisman Trophy in 1970, Theismann was a 4th-round draft pick of the Miami Dolphins in ’71 but signed with Toronto of the CFL instead. After three years in Canada, he joined the Redskins (who had traded for his draft rights) in 1974 but was stuck behind veterans Billy Kilmer and Sonny Jurgensen. Jurgensen retired following the ’74 season, and Kilmer in ’77, at which point the cocky quarterback got his chance to start full-time. He passed for over 2500 yards in each season from 1978 thru ’81, with a high of 3568 in 1981. In the strike-shortened 1982 season, the Redskins went 8-1 and won the Super Bowl. Theismann was selected to the Pro Bowl and received the Bert Bell Trophy from the Maxwell Club. Mobile and a fiery leader, he was well-established as the starting quarterback and had a title under his belt. Redskins went 14-2 and finish first in the NFC East while leading the league in scoring (541 points) and touchdowns (63). Won NFC Divisional Playoff over Los Angeles Rams (51-7) and NFC Championship over San Francisco 49ers (24-21). Lost Super Bowl to Los Angeles Raiders (38-9). Theismann passed for 3391 yards and 24 TDs in 1984 as the Redskins again reached the postseason. He continued to start until suffering a career-ending broken leg in a Monday Night game against the Giants during the 1985 season. Overall, he threw for a career pro total of 31,299 yards (6093 in CFL, 25,206 in NFL) and 200 touchdowns (40 in CFL, 160 in NFL).